It took Leonardo da Vinci years to finish the Mona Lisa. In contrast, the Empire State Building was completed in little more than a year — all 102 floors of it. Leonardo was so good at putting things off that he left numerous sketches for unfinished projects when he died in 1519, doubting in his deathbed whether he ever got anything done. Among other things, this proves that procrastination happens to the best of us. In fact, scientists believe the genetic code in the human brain predisposes us to slack off, take things easy, chill out, and pretend to conduct some serious “research” on Facebook just to avoid cold-calling the next prospect as much as possible. As explained by psychology professor Timothy A. Pychyl on Real Simple, the conflict between the brain’s pleasure-seeking limbic system and its highly rational prefrontal cortex turns the human brain into a war zone, with the primal pull of pleasure winning over reason more often than not. So between watching your favorite series on Netflix and writing the ad hoc report your sales manager requested, you already see a looming conflict when you only have time to perform either one but not both. You: Well, Mr. Johnson, good luck on the ad hoc report that took me some 25 agonizing minutes to put together. Mr. Johnson: Well, good luck on your next performance appraisal. I bet it will bring more agony than you’ve experienced while cramming to finish the report. You can do the right (read: rational) thing instead and be awesome at your profession. The very act of defying procrastination — according to a university website — results to peace of mind and makes you feel strong, purpose-driven and in control. Procrastination costs companies big time. Based on just a single hour of procrastinating every day and a mean hourly wage of $17, companies in the U.S. could be losing an average of $4,400 per year per employee. A company with 15 such workers stands to lose around $66,000 without even knowing what hit them. Unfortunately, this is a conservative estimate since it does not include the opportunity costs of inaction and is set well below the two hours U.S. workers admit to spending on non-job related tasks as detailed by performance coach and best-selling author Rory Vaden. Putting things off also ruins personal finances. Imagine putting off paying your utility bills just a couple of days late or filing a late tax return. The list goes on: Postponing a visit to doctor or dentist might allow a yet undetected medical condition to worsen. Putting off home or vehicle repairs will likely compound the damage, making it more expensive to fix later on. U.S. News & World Report's Gary Foreman explores these all too common scenarios. Procrastination is bad for your health. Putting things off is correlated with sharp spikes in stress levels, hypertension and cardiovascular disease, according to a peer-reviewed study published in the Journal of Behavioral Medicine. There’s an art to doing the right thing “now” that is as compelling as the science behind our tendency to put it off for another day. Read on and learn some procrastination-busting tricks. For many people, putting things off has become an ingrained habit that will take heroic effort to break. Some are not even aware they are procrastinating. Extensive studies on the subject yield alarming figures: 80% to 95% of college students are procrastinators. The practice is similarly widespread in the general population, with chronic procrastination affecting 15% to 20% of adults. Accept the facts. Realize that procrastination negatively impacts your life and rarely produces a benefit. Commit to changing. Start with small doable actions. If you’re assigned a major project, for example, break down the project into smaller, activity-based tasks. In sales, that could mean defining your process as a cycle of stages, where each stage is a set of easily performed and monitored activities. Use productivity apps such as Evernote that help you make checklists and remind you of your commitment to change. Love what you do. Or do what you love, whichever applies to your situation. If you have a passion and you are not doing it, you have a big problem that will likely only be compounded by procrastination. During a commencement speech at Stanford University, Steve Jobs said: “You've got to find what you love. . . . The only way to do great work is to love what you do. If you haven't found it yet, keep looking, and don't settle.” When you’re loving what you’re doing, procrastination will have a weak hold on your attention. Set up a distraction-free environment. Make it more difficult to access anything that diverts your focus from whatever needs to be done. For instance, you can turn off notifications from Twitter or Instagram if social media is not part of your work routine. Here’s an article from Forbes that helps you beat distractions. Automate whenever possible. Technology allows for automating many things you need to do on a regular basis. On the home front, these include auto-crediting your savings or retirement funds each time you receive your paycheck, and auto-paying utilities, insurance premiums and other bills. At work, many productivity apps offer automation features. 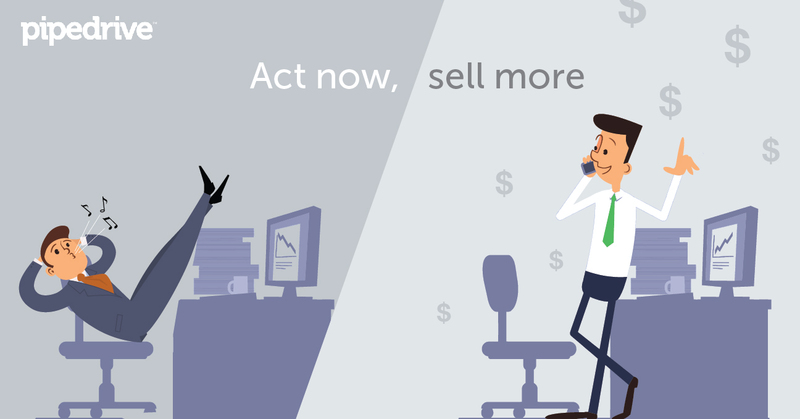 If you work directly in sales, platforms such as Pipedrive can help you automate tedious processes, giving you more time to boost performance or learn new selling skills. Centuries after da Vinci, we still face the same potential-sapping effect of dilly-dallying. There’s a difference, though: Scientists, success coaches and behavioral change experts have probed enough of procrastination to find actionable remedies, which largely depend on YOU — more specifically, on your decisions each time an opportunity to waste time presents itself. So make those decisions count. Remember, you’ll only become better at what you do by doing it.